13 years of Chancellor Angela Merkel is slowly coming to an end according to the established German press (which is normally on her side). 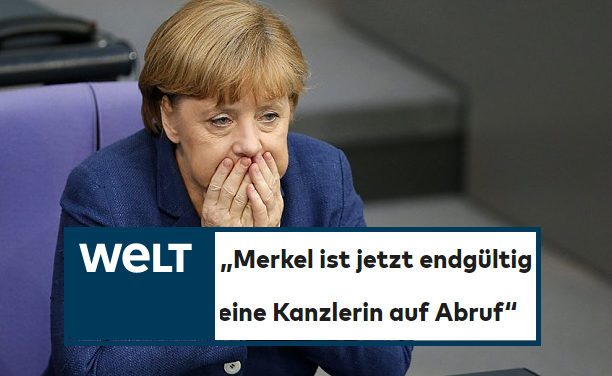 German newspaper ‘Die Welt’ admitted in an opinion piece today that a simple staffing vote, which should have left the political leader of the largest party in the Bundestag with no problem whatsoever, showed how Ms. Merkel can’t even muster a majority within her own CDU/CSU anymore. Peculiarly, the parliamentary vote which showed that Ms. Merkel lost authority happened just at the moment when over in New York, her foe US President Donald Trump was delivering a speech on the world stage. Ms. Merkel wanted her own conservative party to give her longtime confidant and parliamentary group leader, Mr. Volker Kauder, another extension to his time in office. Related coverage: <a href="https://thegoldwater.com/news/37868-Germany-Election-Thousands-March-To-Protest-Merkel-s-Immigration-Policy-Video#37869"> Germany Election - Thousands March To Protest Merkel’s Immigration Policy (Video)</a>. However, the CSU (the Bavarian section of her political party) decided to vote against it, robbing her of a needed majority. This palace revolt can, according to German opinion makers, only end in one way: new elections without Ms. Merkel, the woman who has shaped the fate of Germany and Europe for the last 13 years. The problem for the German political establishment is that there is no one really on hand to replace her. The parliamentary elected officials of Merkel’s conservative Christian Democrats (CDU) and their Bavarian sister party, the Christian Social Union (CSU), will need to look for a leader again as they have publicly damaged their own chancellor. Meanwhile, the anti-immigrant rightwing AfD party looks to be the winner of all this infighting. In the latest polls before the Bavarian elections of 14 October, they are eating away at Ms. Merkel’s CDU ever more and are now leaving the co-ruling SPD socialists already far behind. So it states angela merkel is on her end journey. Why oh why has it taken the last 3 years to make this happen. I guess the German people are stupid. As are the French, Swedish etc. How can Germany actually reverse the past years of muslim in flux? The legal system may not allow this to occur.